Readers think about and search the text, and sometimes use personal knowledge to construct meaning beyond what is literally stated. Use clues to figure out what it really means. 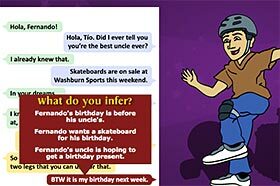 During this activity, students try to infer meaning from a variety of texts, including a text message, a historical photo, a blog, and letters from virtual pen pals. For example, if they choose a pen pal letter, students must make inferences about location ("WHERE is your pen pal?") and inferences about personality ("WHO is your pen pal?"). 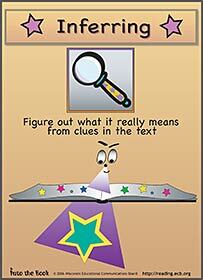 Students search for clues in the text, and then choose from three possible inferences for each clue. In this episode, Mrs. Pingel uses a movement activity to introduce her students to the strategy of inferring. When the class receives letters from their French Canadian pen pals, Lizzy realizes she needs to infer to understand hers. She soon finds herself inside a letter filled with humor and adventure. She later uses inferring to solve a mystery in her own attic.